To activate viewers to participate in the Members Project for American Express, the “Sue vs. Shue” campaign established an immediate call to action by encouraging viewers to choose sides between the show’s two consummate rivals. Treating Will and Sue like heavyweight fighters, I created a series of videos that pitted Sue Vs. Shue in a twelve round fight. But instead of exchanging blows, they exchanged verbal jabs and fans could choose whether Sue or Will won the round. To match the originality of GLEE, every piece of marketing content, no matter how small, is seen as an opportunity to take creativity to the next level. The challenge was to elevate the traditional “recap” by condensing the insanely jam-packed story lines of each GLEE episode into immensely entertaining two-minute shorts. 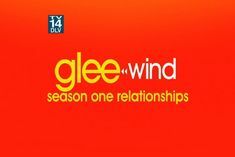 "Glee-Wind Relationships" recapped the intertwining character relationship from Season 1 and helped feed hungry GLEEK's looking for consumable content over the summer.